It’s gotten very cold here in Germany, but it’s cozy and warm in the SAP User Experience Community. So grab a cup of tea and visit us! Check out our new feature: Most recent blogs and discussions on the Community. Another way to catch up on the great content you might have missed! You can also follow us on Twitter and never miss another post! 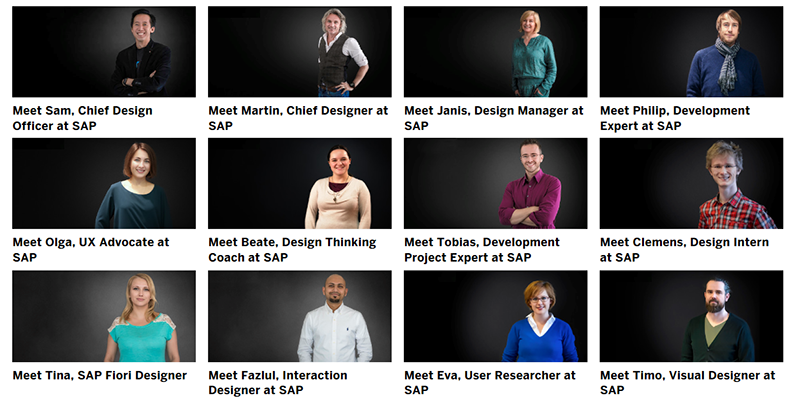 A Dozen Designers is about my small blogging project to reveal the diversity of design roles at SAP and give readers a behind-the-scenes look at the people who have a hand in the design of the software you might be using every day. Fraport AG, the airport managing group of Frankfurt Airport, is using Design Thinking methods and tools to improve security issues as well as the service at Frankfurt Airport. In Prototyping Better Service at Frankfurt Airport with “Scenes” Gloria Costa reports on how this tool was used and perceived at Fraport. In SAP Fiori 2.0: The Object Page – Part 1: Its History, Kai reviews the most important approaches to the object floorplan so far, and how we arrived at the current design of the object page in SAP Fiori 2.0. In SAP Fiori 2.0: A Primer on Embedded Analytics, Kai provides an overview of the embedded analytics concept and explains why it represents a change in the traditional way of working, and why this is significant for the regular business user. Did you know that the SAP Fiori Apps Reference Library now also covers SAP Fiori launchpad content for SAP S/4HANA classic applications? Find out more in News about the SAP Fiori Apps Reference Library by Maricel Cabahug. In case you missed it, here is the first blog in the series: The Human Touch – SAP Introduces a Digital Assistant for the Enterprise. In Talk with SAP CoPilot – The Digital Assistant for Enterprise, Andrea Waisgluss explains how SAP is taking the conversational UI for enterprise to the next level. Need a Vacation? In the Future, Ask Your CoPilot explores in more detail the topic of natural language processing (NLP). In Techfugees – Escalating Humanitarian Startups Maria Camila Lombana Diaz reports from this year’s Diversity in Tech Conference hosted by The Factory Berlin, where panelists used the term “techfugees” to frame a discussion around the city’s tech industry and its growing number of refugees. Matthias Langholz talks about Daimler and SAP partnerning up for Design Thinking Enablement and why Daimler has chosen SAP as a partner for their Design Thinking enablement. Cirque du Soleil is the largest theatrical producer in the world and widely credited with reinventing the circus industry. Boris Verkhovsky, Director of Design and Performance Development, spoke at SAP and talked about Cirque du Soleil’s design process and why, without intense collaboration, there would be no show. Read more in my post, “Wow” Is the Benchmark. According to Andreas Hauser, when SAP HANA is combined with design thinking, the result delivers much more than speed – it delivers innovation. Find out more in his post, Design + SAP HANA = Innovation. Through a partnership with TurboVote, SAP used research and design to help address low turnout rates among America’s young, first-time voters. With over 500,000 new TurboVote subscribers in 2016 alone, the work had real impact. Find out more in Strengthening Democracy Through Design by Tyler Nickerson.